Bishop Renison succeeded The Rev. Canon Henry Cody on October 1st, 1932, as Rector of St. Paul’s Church in Toronto. In the churches 90 year history, at that time, there had only been four rectors. Bishop Renison was the fifth. 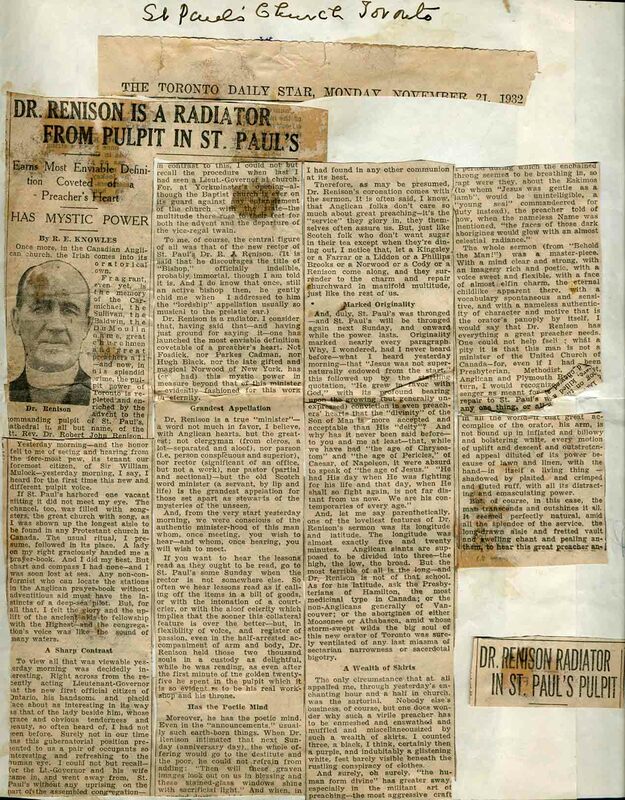 This is a review of one of Bishop Robert J. Renison’s earlier sermons at St. Paul’s Anglican Church on Bloor Street in Toronto. It describes Renison as a “true minister” [which is] “the greatest appellation for those set apart as stewards of mysteries of the unseen” and attributes his eloquence to his origins in Ireland. Bishop and Mrs. Renison visited Harrisburg, Pennsylvania on the occasion of the 36th anniversary of the Diocese of Harrisburg of the Episcopal Church in the United States. 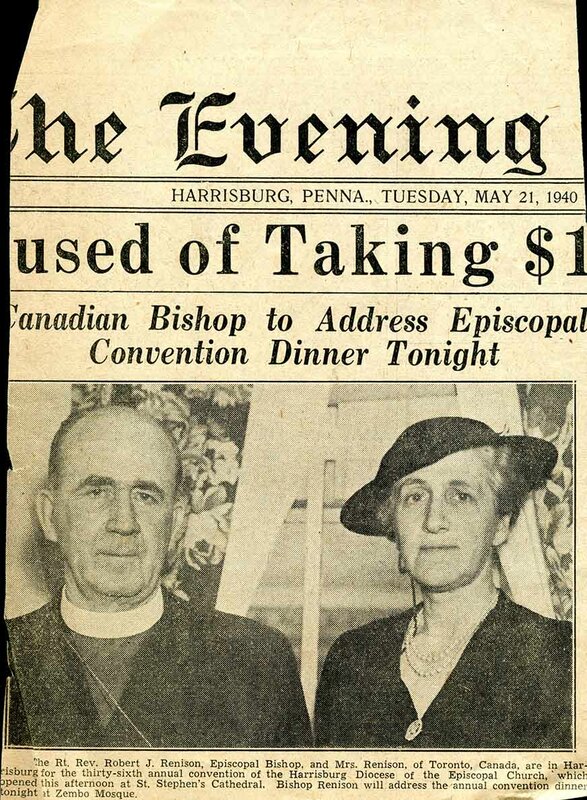 The diocese was established in 1905, so this likely took place in 1941. 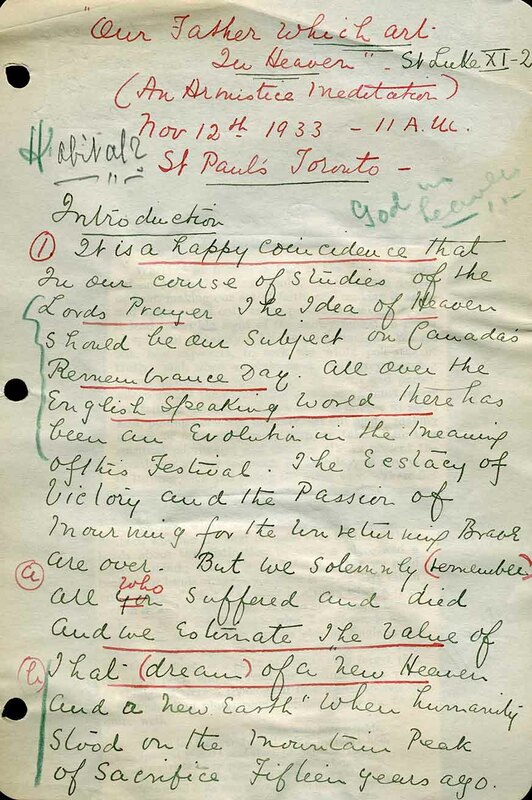 Sermon “Our Father Which Art in Heaven: An Armistice Meditation"
Handwritten sermon note "Our Father Which Art in Heaven: An Armistice Meditation," a sermon preached by Renison at St. Paul's Church, Toronto, Nov. 12th, 1933. Handwritten Sermon Our Father Which Art in Heaven: An Armistice Meditation"